Congratulations to Klein High’s Lauren Houck who was selected to participate in the Lone Star Leadership Academy this past summer. The Lone Star Leadership Academy, hosted by Education in Action, where students examine qualities of effective leaders, practice leadership skills, and discuss what they learn at sites visited. Additionally, Lauren joined other students who are able to add this leadership academy to her resume of academic achievements. Lauren received the Honor Roll award and was selected as the recipient of Daughters of the American Revolution Award while an eighth-grade student at Doerre where she was also a proud member of the National Junior Honor Society, Orchestra, and the Destination Imagination team. She is now a ninth-grader at Klein High where she participates in the orchestra and the Bearkadette drill team. 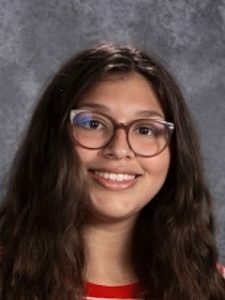 Outside of school she has been inducted into the National Charity League and is currently working towards attaining the Congressional Award through her volunteer work.